So what gauge guitar strings do you want? Electric? Acoustic? Nylon? Bronze? Nickel? Single string or full set? This can be the questions you are interrogated with when going to buy new guitar strings for the first time. In this post Eastern Suburbs School of Music guitar teacher Rhys Lett will unlock the secrets of getting the appropriate guitar strings for your needs. Many different brands, styles and sounds. This photo contains string sets for different styles of guitar. What Guitar needs new guitar strings? Do you understand what type of guitar you have? Essentially there is three types of guitars. Is your guitar a nylon string acoustic (classical guitar), steel string acoustic or electric guitar? Each guitar requires the right type of strings purchased for it. You will not be able to put steel string acoustic guitar strings on a classical guitar. You will find this will destroy the guitar due to the tension the steel strings will place on the neck. Why do you need new strings? Have you broken just one string that needs replacing? Would you like to completely restring your guitar? You can purchase individual strings or a full new set. Understand if you want to purchase a single string or a full new set. Which type of guitar strings? Electric Guitar – 10 to 46. Steel String Acoustic Guitar – 12 to 52. Nylon String Acoustic – Normal tension. Individually strings increase in thickness as we progress through the highest pitched string to the lowest. When Should I Change Strings? Strings will natually corrode and decay over time due to factors such as the natural oils of your skin and the environment the guitar is kept in. Strings will also lose their ability to return to the precise point of being in tune as they are stretched from age. I recommend to students they change strings at least once every three months. This will keep the instrument sounding its best. 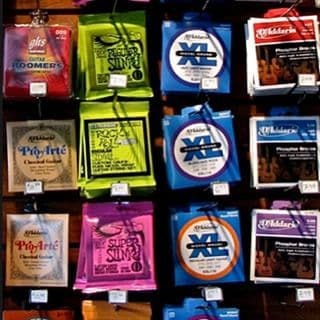 Need strings? They can be purchased from KC’s Rock Shop for students attending the Boronia location, or Guitars and Things in Frankston for those attending the Carrum Downs premises.